Home picture of the day Planetary Windows into the Past? Planetary Windows into the Past? The astronomical subdiscipline of comparative planetology is an offspring of the wealth of in situ measurements obtained by space probes. An improved understanding of the physical and chemical conditions prevailing on other planets and moons in the solar system not only helps to place terrestrial systems in a sharper perspective, but also carries the potential to shed light on circumstances that may have characterised earlier phases in Earth’s history, such as times of extreme geomagnetic instability. Among cognoscenti, the latter inquiry barely appears to have been broached. Unlike the situation on Earth, Jupiter or Saturn, the magnetic dipole field of Uranus is strongly displaced from the geometric centre, tilted at 59º from the rotational axis and highly variable in intensity across the surface, with a strong multipole component. Following observations made by the satellite Voyager 2 in 1986, it was clear that Uranus’ magnetic poles corotate with the planet and aurorae occur directly above them. 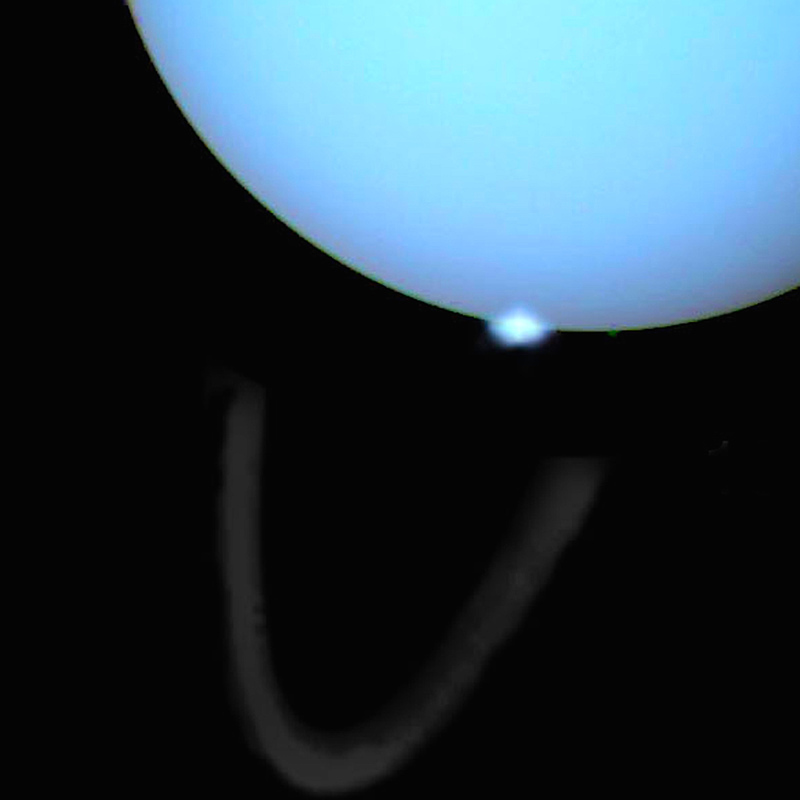 The Hubble telescope imaged Uranus’ aurorae against the planet’s equatorial rings, again not in line with the rotational poles due to the lopsided placement of the magnetic field. According to one report, the forms exhibited on that occasion were “bright spots of activity on the planet’s daytime side – most likely a result of Uranus’ peculiar orientation, as well as its seasonal alignment” rather than “rings of bright emissions, as witnessed on Earth as well as Saturn and Jupiter”. That is to say, the auroral zones take the form of ‘spots’ instead of rings. In recent years, the French astronomer Jean Lilensten and his team successfully replicated Kristian Birkeland’s terrella results on their own device, the ‘Planeterrella’. They related one of the particular configurations they obtained to the situation on Uranus. This confirmed the presence of an auroral patch on the planet’s ‘dayside’, while predicting that of an auroral ring on the ‘nightside’. Apparently, Uranus’ atypical field causes immense variation in the planet’s aurorae when it switches its dayside and nightside, though this is different from its ‘daily’ cycle as defined by its axial rotation. Could Uranus’ magnetism – or that of Neptune, which is similar – be viewed as a modern analogue of the earth’s magnetic field when it is in the opening or in the concluding stages of a reversal or excursion, with a weaker dipole field? Certainly, the observations on Uranus lend support to the expectation that auroral zones will still form above magnetic poles if the latter are heavily inclined with respect to the rotational axis. Uranus’ “bright spots of activity” bring to mind the stationary luminous patches or enclosures associated in human traditions with the early stages of ‘creation’, often preceding the formation of axes mundi. The situation on Mars provides another possible parallel with past extreme conditions on the earth. Mars lacks a global dipole field, but exhibits many localised regions of intense crustal magnetisation. Since 2005, aurorae have been detected – by the Mars Global Surveyor (MGS) – precisely in cusp regions on the nightside above “the strong crustal magnetic fields in the southern hemisphere of Mars”, where the planet’s feeble magnetism is at its strongest. It is thought that incident particles are directed through these cusps along field-aligned currents in flux tubes, until they excite molecular species in Mars’ upper atmosphere. The low latitudes at which the phenomenon occurs gave rise to the designation aurora aequatorialis. On Earth, equatorial aurorae occur only under exceptional geomagnetic conditions. In addition, the absence of a strong intrinsic magnetic field enables the formation of vortical plasma instabilities on the interface between Venus’ atmosphere and the solar wind. In 1963, an anonymous science writer expressed a hunch that “the field of Venus is in the middle of undergoing a reversal of direction”, that the satellite “Mariner caught Venus at just such a moment” and that this accounts for the “signs of auroral displays on the dark side of Venus”. If this ignored hypothesis retains some validity, the situation on Venus may be indicative of how the earth’s aurora might respond to a weakened magnetic field, when the solar wind interacts directly with the outer atmosphere. Several planets in the solar system thus present magnetospheric and auroral conditions which may also have characterised the earth in the various stages of geomagnetic reversals and excursions. At such times, aurorae may have appeared above minor magnetic poles, far from the rotational poles, in the form of concentrated patches or diffuse ‘nightglow’ and accompanied by intense plasma instabilities. Such scenes would go a long way towards an illumination of common themes in global creation mythology. This prompts a pivotal question: did a geomagnetic reversal or excursion occur within human memory? Failed Star or Cosmic Short Circuit?